Maybe this is the year the jewel regains its sparkle. 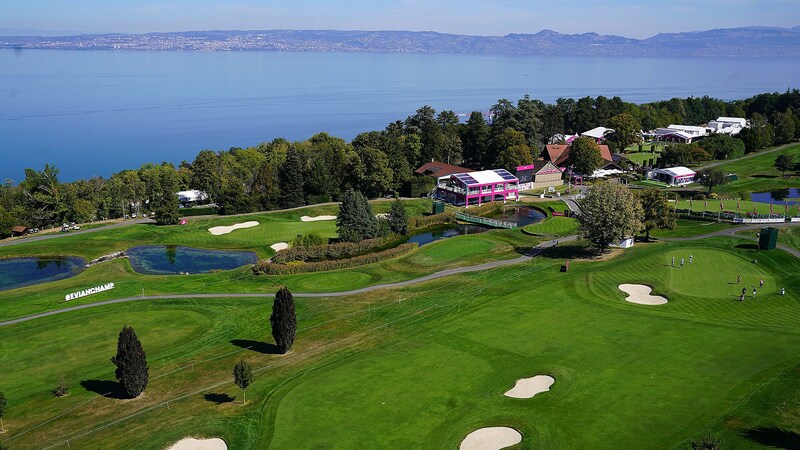 The Evian Championship has the makings of something spectacular as the LPGA’s fifth major, with its picturesque backdrops on the mountainside above Lake Geneva in the shadow of the French Alps. The setting is majestic, the views breathtaking. LPGA commissioner Mike Whan imagines Evian with a compelling future. “I have zero doubt in my mind that five, 10, 15, 20 years from now, young women all around the world will have a dream to make it to `The Mountain,’ to see that skydiver parachuting down with their country’s flag at championship’s end,” Whan has repeated as a mantra in his vision of the event. The problem is Evian has been more volcano than mountain, with controversy erupting with too much regularity. Since Whan unilaterally declared Evian a major championship and moved it to September beginning in 2013, there has been something of a meteorological curse on the event. The rainfall has been just short of a biblical plague, with last year’s finish played in hard rain, heavy wind and even hail pummeling players. Two of the first five Evian Championships played as a major have been controversially shortened to 54 holes. The weather issues have brought scrutiny over the LPGA’s priorities in the governance of its majors, and whether the decision to upgrade Evian was more about creating a major showcase for Group Danone than creating a major championship. It’s why so many players were excited when Whan announced that Evian will be returning to July next year, the spot it held on the calendar before it was declared a major. Nordqvist and Brittany Altomare were at the center of last year’s controversial finish. They played their third shots into the first sudden-death playoff hole in near darkness with sleet and hail pummeling them. Even with grounds crew squeegeeing the greens before they played, puddles re-formed on the green. By allowing Nordqvist and Altomare to play to a green so obviously unfit for deciding who wins a major championship, the LPGA put the integrity of the competition in jeopardy. Neither player hit the green, avoiding the real possibility a puddle would have swallowed their shots or caused their balls to skip. The priority didn’t appear to be identifying the best player by setting up a thorough examination of skill, concentration and resolve. The priority appeared to be to finish on Sunday, barring fire and brimstone coming down from the sky and barring the pond at the 18th hole turning to blood. The fact that the decision to shorten the event to 54 holes was made so early in the championship only reinforced suspicions. The tour announced it was shortening the event on Thursday, after controversially wiping out an abbreviated start to set up a restart of the first round on Friday. Nordqvist is among LPGA pros who don’t like seeing majors shortened to 54 holes, even though she won last year’s. “Major championships should be 72 holes, unless there are certain circumstances where the golf is unplayable,” she said while preparing to defend her title. “I definitely think it should be crowned over four rounds. I feel like that would be the best for everyone. The decision to shorten to 54 holes led to speculation the LPGA was trying to maximize Sunday’s TV window exposure, and to satisfy the needs of an important title sponsor, and to avoid the expense of a Monday finish and the complications of extending lodging in a small resort town. Whan said a terrible extended forecast was the driving force. He said the prospect of prolonging the event into a less interesting mid-week finish was a factor. He also said it was solely the LPGA’s decision, not Group Danone’s. Whan stepped up to take the blame for Evian’s challenges, saying the move to September brought more rain and less daylight into the championship equation. “At Evian, the challenges we face are manmade, and I’m the man who made them,” he said. The commissioner, who gets credit for rebuilding the LPGA from its foundering state after taking over almost nine years ago, pledged a better future for Evian. “Everything about Evian is going to work long term,” Whan said. The week opens hopefully for this year’s field. Reigning ANA Inspiration champ Pernilla Lindberg relished practicing under blue skies on Tuesday. Georgia Hall, winner of last month’s Ricoh Women’s British Open, seconded that. Trouble, however, lurks once again. Forecasts call for a mid-day thunderstorm on Thursday with 50 percent chance of showers on Friday. “Crossing our fingers it will stay like this,” Lindberg said. Players want to see the sun can put a sparkle back on their jewel.